It's about time to finish my war on 40k misconceptions. And the last but not least come myths about xenos races and followers of Ruinous Powers. A lot of notions regarding these factions often end up incorrect, because they are more commonly used as antagonists, which way too often results in their lore being left underdeveloped. A lot of myths regarding Chaos and xenos are also born when other factions' fans try to show their opponent's faction's inferiority, often twisting the lore in order to achieve this. In retaliation even more misconceptions are made, complicating the situation even further. So let's separate the real lore and the mistakes. Lore: Orks are only a single bioform of a greater orkoid race, one that fulfills the warrior and ruling roles. All other functions important for the functioning of the their society are fulfilled by different sub-races: gretchin serve as workers and servants, while snotlings fulfill the role of the peasants. These are often referred to as separate species, but this is far from the truth, since all of these bioforms have the common animal/fungal genome and grow up from the same spores they all produce. Together, orks, gretchin, snotlings, squigs and other fungal and microscopic forms of orkoid life form a self-sufficient ecosystem that actively spreads and supersedes all other forms of life on all levels. This makes orkoids even more than a race - it makes them an extremely aggressive biosphere of their own, similar to a virus in some ways. It's this infection that threatens all worlds attacked by orkoids, and it is what often dooms the attacked world to an eternity of war against greenskins even when the invading ork armies fail to overcome the planet's defenders in an initial attack. Lore: Most greenskins don't trouble themselves with complex matters, but their oddboyz have impressive intellectual abilities when it comes to their area of expertise. For example, ork meks are born with a deep technical knowledge and understanding of complex physical principles. They even use their own sub-type of ork language, known as Mek Jargon that includes complicated mathematical and physical terms. Admittedly, this level of intelligence is rarely shared by Ork bosses, but a lot of them are still capable of making complex long-term planning and performing other intellectual tasks, such as learning High Gothic. Greenskins are often mistaken for having low intellect on account of their low sense of self-preservation caused by their famously impressive resilience. When it comes to ork technology, most of it is indeed rather simple in construction due to the chaotic structure of ork society and the particularities of their expansion. However, it is known that greenskins are able to master even the most complex technologies, such as anti-gravity, and in the areas like teleportation, force fields and bionics they surpass many races considered very technologically advanced. The truth is, orks don't shy away from technology, they just tend to find the easiest solution to any problem. Greenskins often use ways humans often won't think of and employ the complex tech only when they find it convenient. For example, orks may often be too lazy to construct the void-proof hulls for their spaceships, and they might find it easier to construct a force field generator that will keep the air inside. There are a lot of cases of technical specialists of other races' failing to understand the workings of some Ork tech despite their best efforts. Of course, the Ork Meks themselves often can't understand how their own tech works, but it doesn't make it any less technologically advanced. Lore: Many ork spanna boyz are perfectly capable of creating basic firearms on their own, to speak nothing about melee weapons. When it comes to more complex tech, much of it is constructed on Mek-controlled factories that use gretchin or human slaves as a workforce. Greenskins even have their own Forge World counterparts - planets like Tigrus and Moredakka. 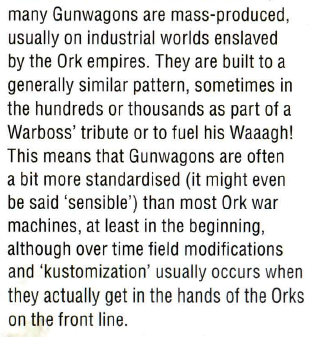 This factor is partially responsible for some degree of unification in ork vehicles, although Meks in factories are still as prone to experimentation in their strive to overdo each other, as are the green-skinned buyers, who never miss a chance to somehow upgrade a machine they have purchased. Lore: This widespread misconception attempting to make greenskins into some form of psychic-only creatures is based on a in-universe (i.e. biased) piece of fluff and has no confirmation from an objective standpoint. Said piece of fluff was only written to show how strange and incomprehensible to the human mind some xenos tech might be, and how even the greatest scholars often find it impossible to understand its workings. It's important to understand that despite often looking like a bunch of crude scrap bolted together, ork tech frequently involves the use of complex technical knowledge that makes it perform way above expectations. 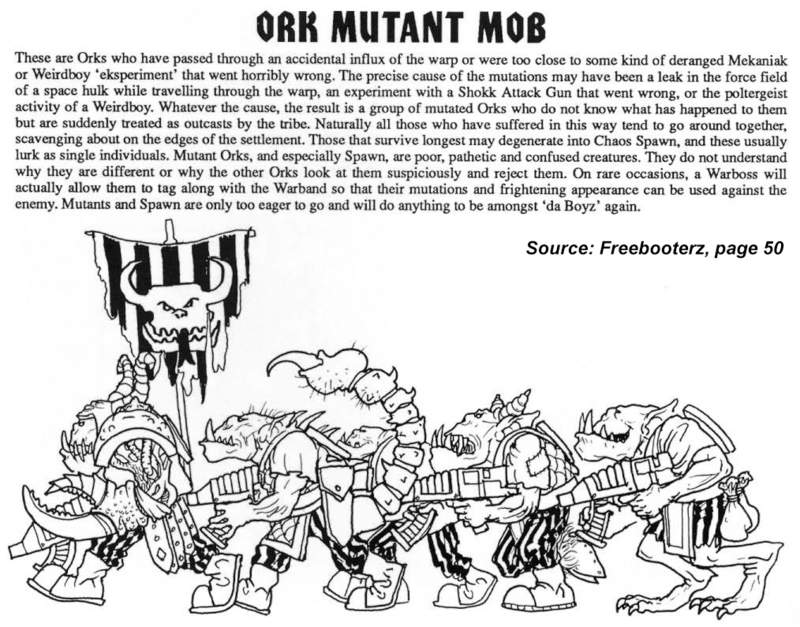 Lore: Every ork clan favors its own colours, be it for its brightness, alleged ability to bring luck, or some other property. The "fast" red colour is only favored by Speed Freaks and members of Evil Suns clan. Greenskins of other clans prefer their own colours and paint their weapons and vehicles otherwise. The colour all orks appreciate is a natural green of their skin - that's why the Kommandos who cover it are often frowned upon by other boyz . 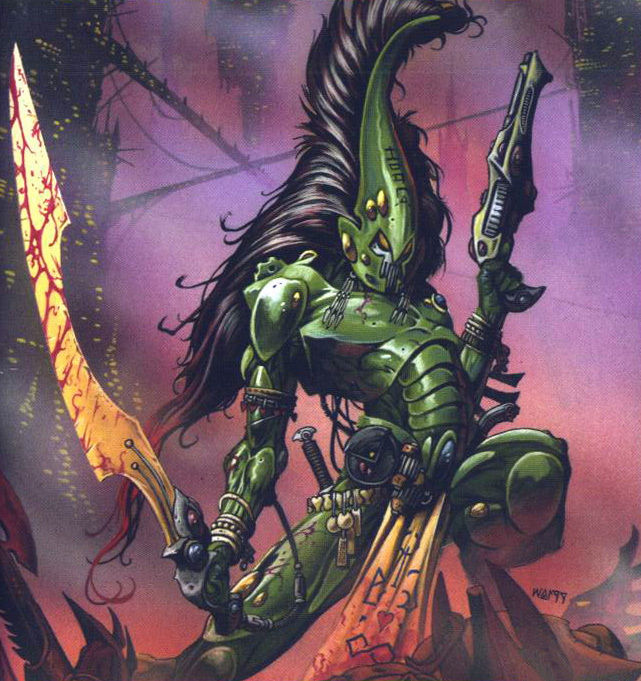 Lore: When greenskins have a specific target world in mind, they are perfectly able to make purposeful Warp-jumps to specific star systems, otherwise it would be impossible for them to gather in numbers huge enough for a Waaagh! However, admittedly, most of ork attacks are not a part of a big invasion, but are just small pirate raids, and the bosses planning those often indeed aren't picky in choosing the inhabited planet to attack - if there is no good fight around, the boyz will have to start their own anyway. Lore: Orks' remarkable toughness and their unique way of reproduction make it very difficult for mutation, Chaos cults and genestealer infestation to spread among them, compared to the ease in which said hazards can ravage human civilizations. 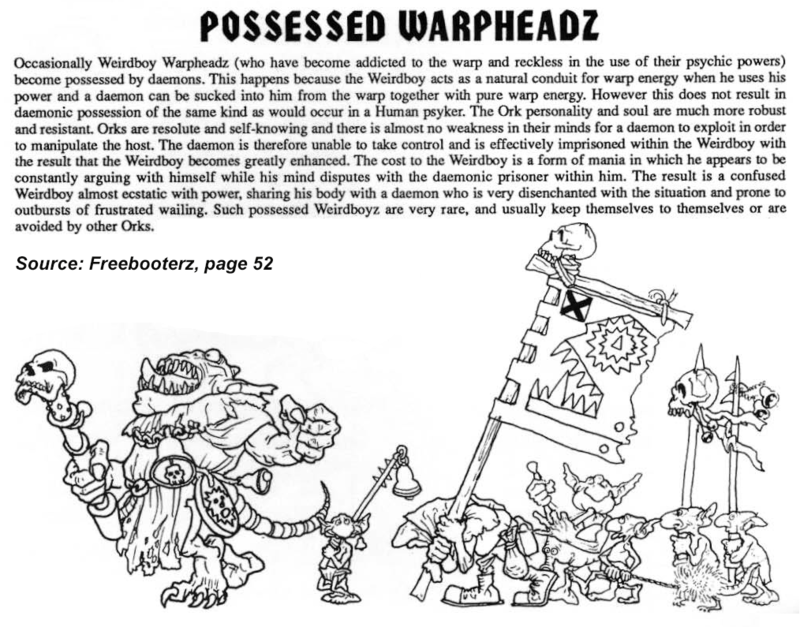 However, greenskins have no immunity to any of those threats and there do exist freebooter warbands, members of which are mutated due to the influence of Ruinous Powers, worship some of them (usually preferring Khorne or Nurgle) or hide genestealer-infected individuals in their ranks. These groups are commonly mistrusted or outright slaughtered by other orks, who are reluctant to associate with the 'unproppa' boyz. The unlucky greenskins, in their turn, tend to go out of their way to try to fit in general ork society. By and large, when it comes to Chaos corruption, few races are totally immune, and even certain eldar and tau have fallen over the millenia - it's enough to bring up such names as Arhra and Kais. 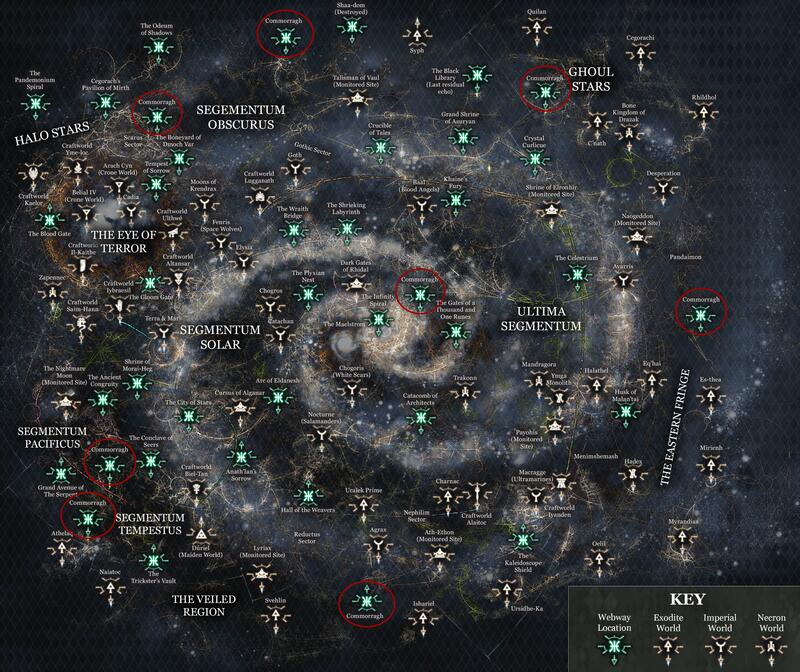 Lore: Pech and other Kroot planets are included in the Tau Empire, but Kroot differ from other Tau-allied races, such as Vespid or Nicassar, because their race is not fully incorporated in the Empire. Instead, peculiarities of Kroot evolutionary process force a giant part of their civilization to nomadism, and many Kroot kindreds leave their homeworlds to travel the galaxy in their Warspheres to live as mercenaries. Contrary to many xenoraces, Kroot are not xenophobic and are willing to work for humans, orks or members of any other race that are willing to pay them, occasionally returning to Pech in order to share the genetic material they've gathered with others of their kin. This fact is hidden from most Tau, who mistakenly think of them as allies and don't have a clue of their mercenary ways. Similarly, the sslyths are often thought to be completely subjugated by dark eldar. This is equally wrong: sslyth are also a race of mercenaries who almost always use weapons and tech of the race they are employed by. 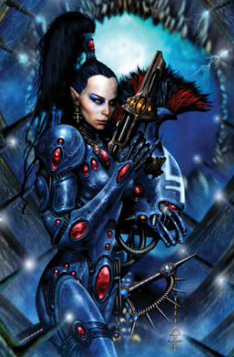 They tend to prefer to be hired by eldar, but their ultimate loyalty lies only to the highest bidder. Lore: Tau Empire is a major faction in most games set in 40k universe, but fluff-wise they are a much less important force. There are many similar xenos empires in the galaxy, such as Draxian Hegemony, Worldweave of the Noisome Reek, Church of Dracolith, or the domains of such races as khrave, thyrrus or q'orl (see map) who present a powerful but local threat. Among such empires, Tau is one of the largest, but the lack of Warp-travel technology drastically limits the speed of its expansion, and confines influence of this race to the eastern fringe of the galaxy. Because of it, most inhabitants of the Milky Way don't even know of the existence of tau, as opposed to races like kroot or hrud, who are less important for the game, but are much better-known in-universe. Lore: Caste system that defines the person's entire career path and is the main characteristic of the tau society is incompatible with communist ideology. Tau'Va is further differs from it by an inequality between the members of the Empire: Ethereals form a privileged caste, while members of most allied races are openly considered to be second-class citizens. Lore: Another misconception arisen from a in-universe biased theory if a single individual, this idea has no real proof and is introduced only to illustrate how strange and effective is the influence of Ethereals on other Tau. There is no solid explanation of how this influence is exercised - pheromone idea has no solid confirmation behind it and was always presented just as a one of the theories. 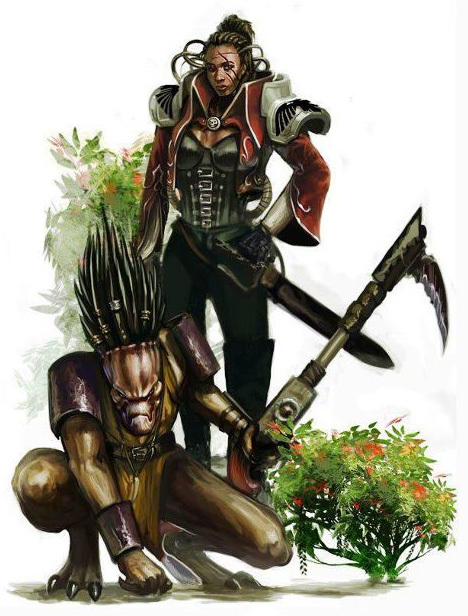 Lore: Tau and eldar may seem less alien to humanity than other xenos races. But these species are as xenophobic as the Imperium - they both hold themselves as the greater race and will not accept the humanity as equals. In the end, each faction has its own interests in mind, and the competition for worlds and resources prevents any lasting peace - all treaties between the species remain temporary. 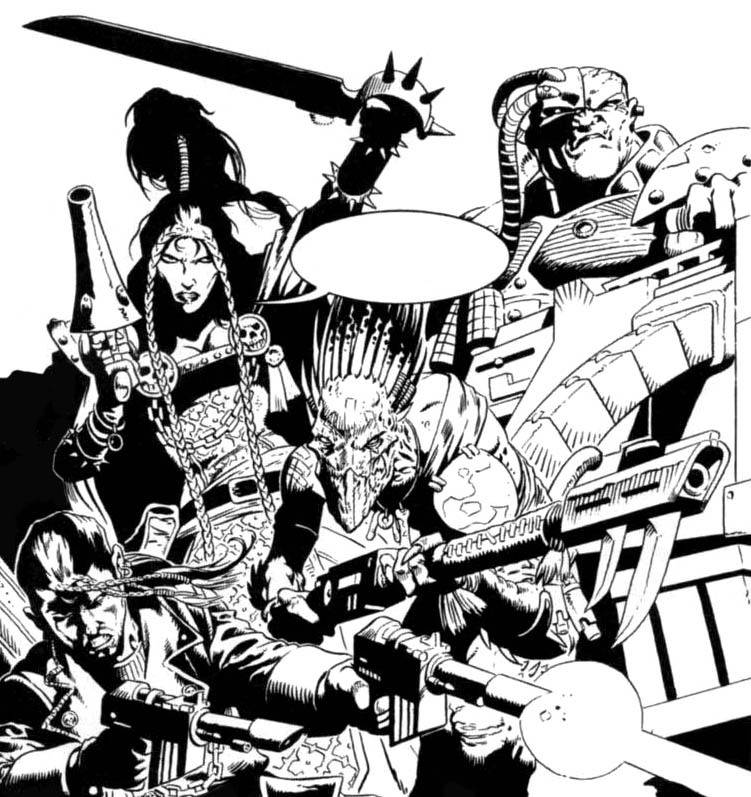 Lore: Dark eldar are the only group that remains true to the perverse and hedonistic ideals of the old eldar empire that existed before the Fall, while other eldar factions are a little more than runaways that rejected those ideas. For example, the Paths of the Craftworld eldar are anathema to the traditional ways of this race and have appeared very late in their history. In other words, in contrast to most settings featuring elf-type races, in 40k it's the other way around: craftworld eldar are a twisted version of druchii. Lore: The Webway dimension does not obey the laws of the natural world, and it is much more complex thing than just a three-dimensional labyrinth. 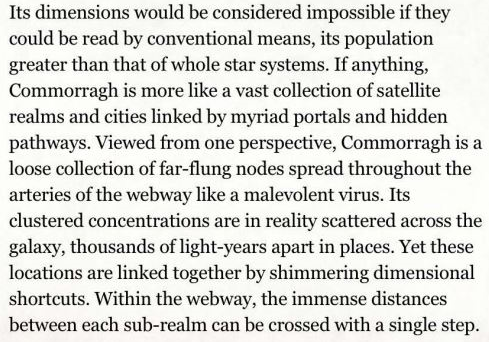 The junctions of the Webway are connected by portals and trans-dimensional passages that make it possible to cross the galaxy by making a single step. That's what makes possible the existence of Commoragh - the impossible city that is located in every corner of the Webway at the same time. The Dark City is basically a collection of a myriad megalopolises and satellite realms like Shaa-dom, Pandaminion, Sable Marches and Aur-Ilithain connected by portals. Most of them were once separate cities of their own, and many others separated from the Commoragh at some point of its long history by closing their portals and declaring themselves independent. But, due to the efforts of Vect, by the time of M41 most of them form a part of immense tangle of architectural contradictions that is Commoragh. Lore: Tyranid hive mind is a great strategist, that always learns from its mistakes, never repeats them and constantly masters new strategies, tactics and various ways to make the consumption of other races more efficient. 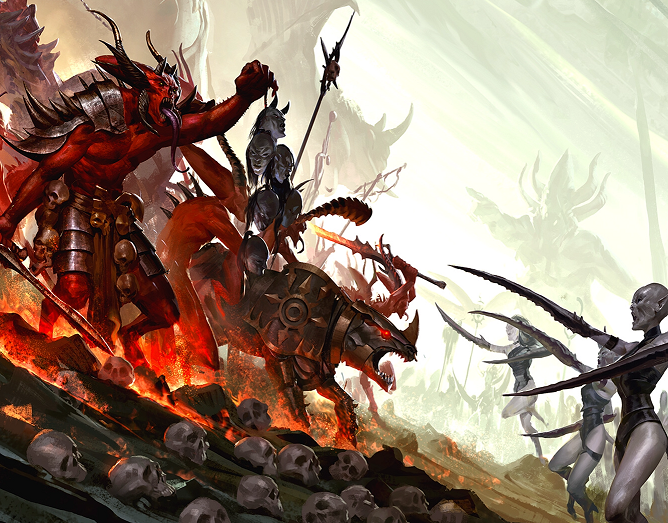 Tyranids' strategic adaptation is as rapid as their physical evolution and is a big part of what makes this race so incredibly dangerous. 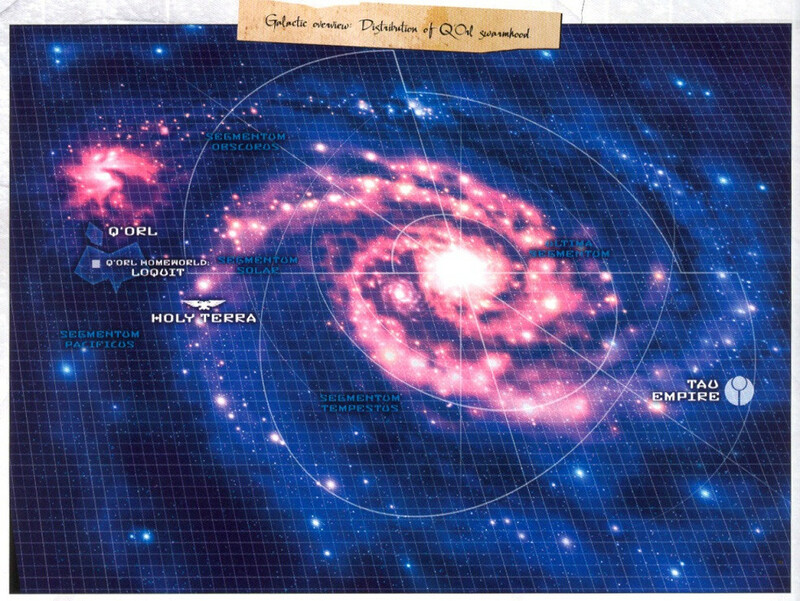 Lore: Even though both of these races became a galaxy-level threat only by the Time of Ending, the Imperium has endured numerous full-fledged conflicts with them long before M41. You probably know about Tyranid creatures that inhabited Milky Way for millenia, such as Ymgarl genestealers, Catachan Devil or Kraken from Fenris. Their existence by itself is an evidence of an earlier Tyranid invasion. 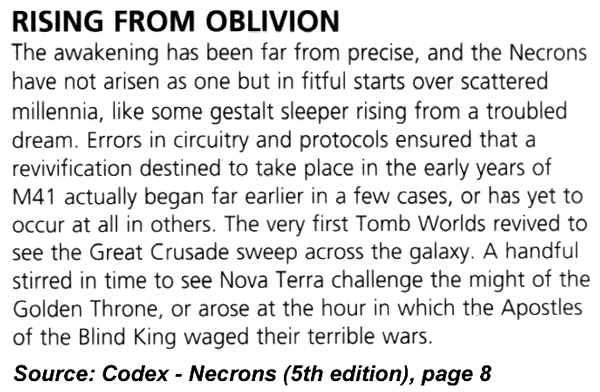 There are also several well-documented ones, like smaller hive-fleet Colossus, Ouroboris Wars and quarantine of Tiamet. Numerous discoveries of ancient Tyranid creatures, like the one described in short story "Exhumed" from Deathwatch: Xenos Hunters anthology serve as further proof. "The Last Ditch" even mentions a buried hive ship dating to at least a thousand years before M35. When it comes to the Great Awakening it's important to understand that it did not occur simultaneously, and many Dynasties awoke much earlier than others - there are even mentions of some tomb worlds active at the time of the Great Crusade. Lore: While Chaos daemons do relish every opportunity to manifest in the material world, all efforts of their dark masters are devoted to the Great Game - eternal struggle for power between each other in the Warp. To them, the conflict for the minds of material beings is not an end in itself, but merely a means to gain an advantage in the Game. 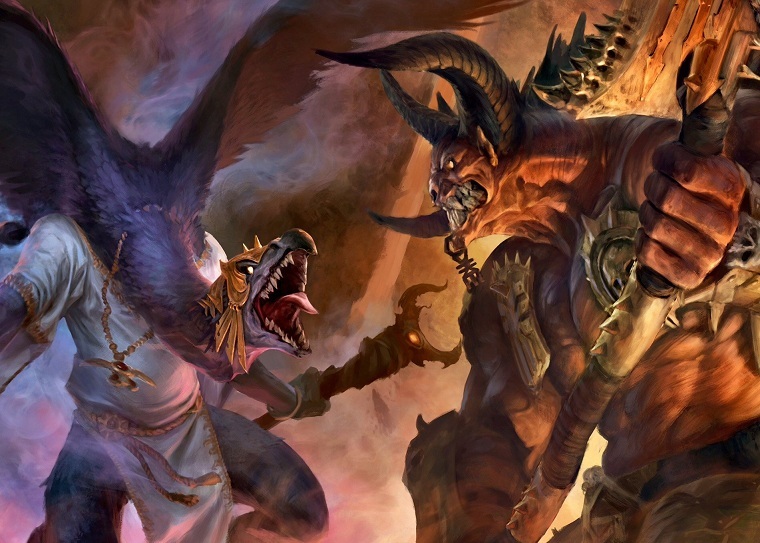 All wars Chaos worshipers and daemons wage in the Materium are but a reflection of an eternal struggle between the Dark Gods, as well as the way for Chaos champions to gain favor of one of them by offering more power-giving passion of mortals to their masters. Lore: Slaanesh is a god of self-improvement, drive for perfection, hedonism, pleasure and pain. It feeds on all mortals' cravings, like gluttony or admiration for bright colours and loud sounds. 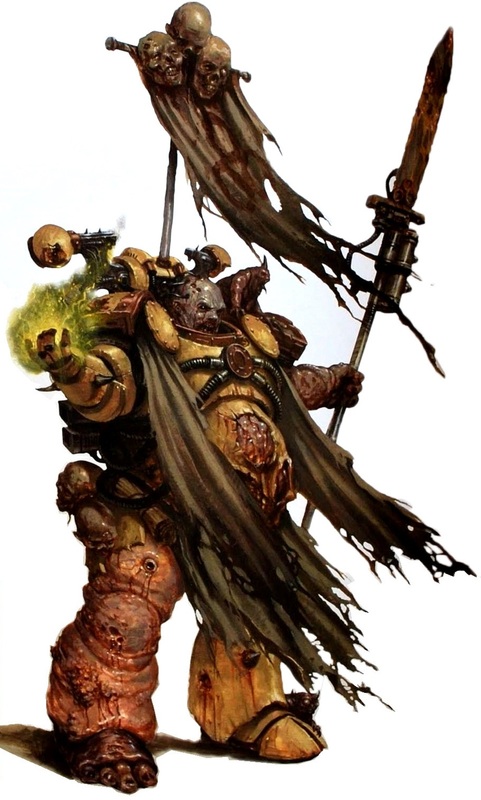 Lore: Nurgle is a god of despair, death, toughness, rebirth, acceptance, life and corruption, both physical and mental one. Diseases give him power only as long as they bring these things with them, so not all corruption his children bring comes in form of a disease. And, to cover another misconception, he is not opposed to sorcerers in any way. 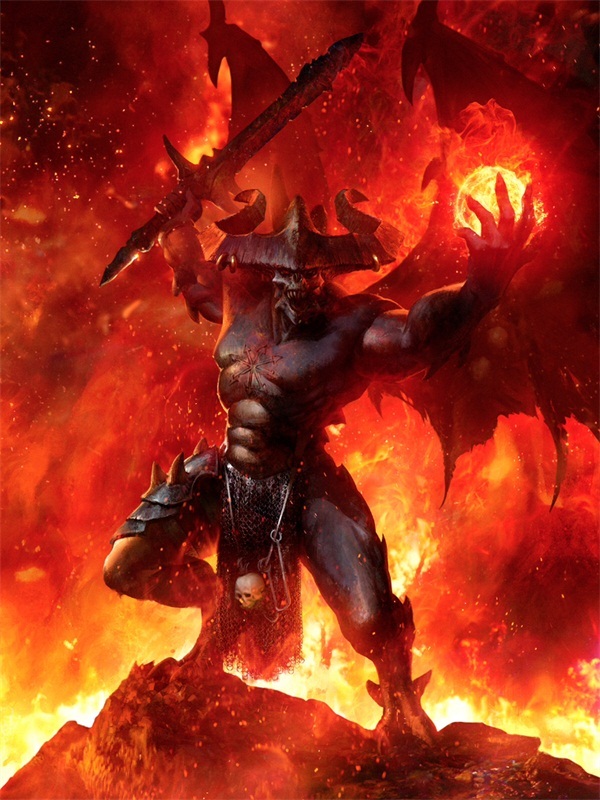 Lore: Khorne is a god of rage, strength, blood-thirst and battle prowess. He has no special preference for any type of combat and many of his followers prefer to worship Lord of Skulls in long ranged bloodshed. Some members of the World Eaters legion considered the active use or heavy weaponry dishonorable, but by the end of M41 many Khorne worshipers fight at range, to say nothing of his human followers, like members of the Blood Pact. Lore: Tzeentch is a god of hope, plans, physical and mental change. He does not get power from sorcery on its own, and many of his followers are just clever intriguers, revolutionists, betrayers and other Chaos champions. Obviously, the opposite is also true: not all Chaos sorcerers worship the Changer of Ways. 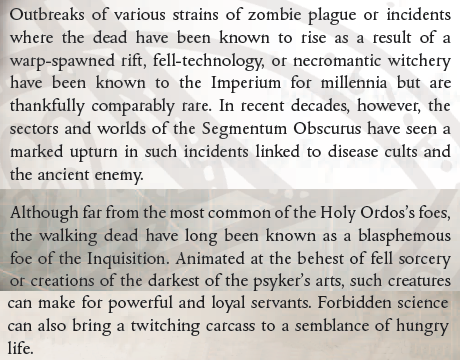 Lore: By the time of M41 the phenomena of the living dead was known to the Inquisition for thousands of years, especially in Segmentum Obscurus. 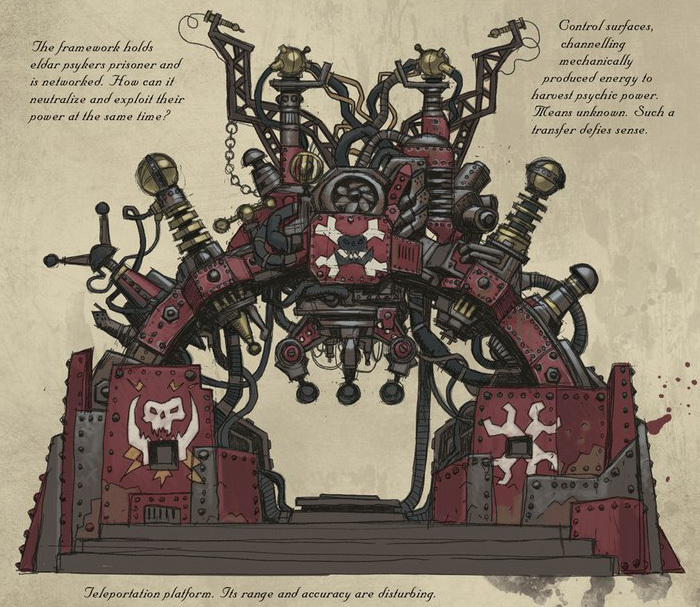 They are also not necessarily summoned by a Nurgle plague or Warp-necromancy: many Dark Mechanicum use forbidden technical arts of altogether different origins to bring the corpses back to life and use them as a cannon fodder or as a cheap manual labor. Lore: Ten millenia that passed since the Horus Heresy haven't had the same effect on the renegades that they've had on loyalists. Distortions caused by the prolonged existence in Warp-anomalies shortened the time passage for most of them. Warbands that weren't heavily exposed to this effect have suffered inevitable losses over the years - losses that had to be replenished by the new Astartes from traitor chapters and other, more sinister sources until most of the original legionnaires were replaced by newcomers. 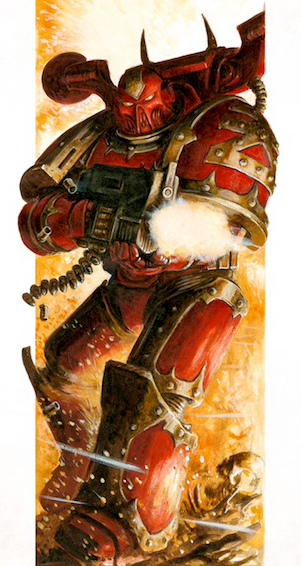 As a result, most of the Chaos Space Marines in M41 are not any older than their loyalist counterparts. Lore: After the death of Horus and a ten thousand years of a Long War none of the Legions retained their integrity. Some, like World Eaters, were totally divided and scattered, while some managed to retain of rebuild some of their organisational structure under the influence of powerful leaders like Abaddon, but the transition of warriors from warband to warband, inner betrayals and the reinforcements by the renegade Astartes warriors have made a mockery of their old structure. The organisation principles of the Great Crusade were almost totally forgotten, and by the time of M41 Chaos Space Marine armies consist of warbands that wary wildly in their organisation and gripe with each other as often as they wage war against common enemies, united by the will of powerful Chaos Lords. Lore: The Eye of Terror is an area of space touched by the primal Chaos and is impossible for anyone to control. Daemons, cultists, fallen Astartes, xenos that succumbed to Ruinous Powers and various warp-beings constantly struggle there against each other for space and resources, the most important of which is an attention of the Dark Gods. 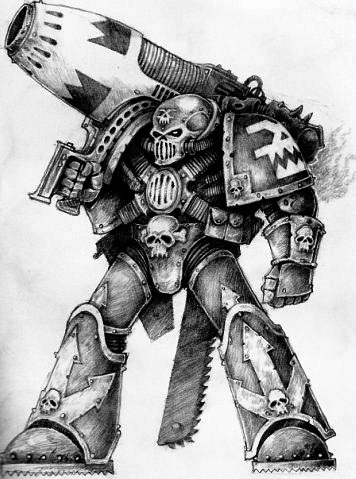 Lore: Despite usually serving as a main antagonist faction in all of 40k, the Chaos is a much more than just an obligatory evil side of the fight. Servants of Chaos are not evil in a traditional sense - they are just obsessed by a particular emotion, surrendering all control over it. In fact, all gods of Chaos embody certain positive aspects, it's just that everything taken to the extreme becomes much less pleasant and sane. As a result, anyone who fights Chaos ultimately fights against the manifestation of emotions that have their place in their own heart as well. For example, a marine fighting a Khorne berzerker shares his opponents' wish to see his enemy's blood while the inquisitor that roots out the Tzeench cult wants to exact changes according to his ideas. Thus both feed the very god whose power they strive to diminish. That's what makes the fight against Chaos such a difficult and ultimately futile endeavor. In a lot of ways, Chaos can be compared to a faceless entropy: it is neither bad nor good, it is just an essential part of the 40k universe that has its inevitable influence on everything in it. Lore: Warp-anomalies like Eye of Terror and Maelstrom are the major, but not the only harbors for the Chaos forces. 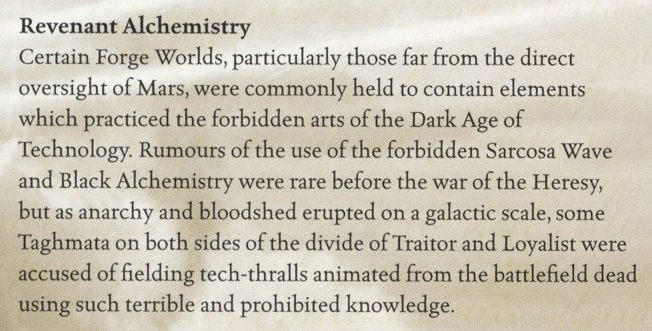 A lot of warbands originating from the Dark Lords and Alpha Legion operate in other areas of the galaxy, to say nothing about the immense numbers of renegades, cultists and Dark Mechanicum. Only the daemons are more often found in these anomalies, and it's only because it's much easier for them to manifest in a material world there. Lore: Daemons can posses nearly everything, including inanimate objects, and human possessed are relatively common, although strong Astartes physiology is preferable to most warp-beings. The ascension caused by the attention of a Chaos god is also theoretically possible for any mortal human or xenos, although, again, Space Marines are much more likely to reach this apotheosis. Finally, any living thing is vulnerable to the Obliterator virus, even Tyranids. Here are a couple examples - a creature that became the Daemon Prince even before the first Astartes was made. And a possessed ork. So this concludes my myth-debunking series. Hopefully, I've managed to help someone to learn the lore a little better. Thanks to everyone who pointed out myths on various forums, provided sources for refutations or just took the time to read the stuff. By the way, before finishing this part I took some time to edit the first two - I corrected a couple of errors using helpful feedback from the readers and even added a pair of new myths. But if you think disagree in one matter of another - come at me, bro. It is true that you said chaos is the emotional spectrum but lets say i entered your house, butchered your family just because i was hungry doesnt change the fact that i still did something evil. Secondly you seem to favor the Orks alot. Honestly WH40k needs a primitive/brutish race and thats exactly what the ORKS are, i know some of them are slightly smarter but that doesnt change the fact that most of them are stupid warmongering beasts. Why? Because if they were really smart they would have become the dominant race in the galaxy by now, the only reason they are behind is because they only live to fight and fight they do even agasint their own which is good news for the Imperium. The stupidly ridiculous amount of passive abilies the Orks have make them the most OP joke race ever. A lot of the refutations were changed due to feedback from the readers, but I can't really agree with you here. The concept of evil has no meaning without humanity to define it and a huge chunk of it worships Ruinous Powers. Stagnating and oppressing Imperium is much closer to their definition of evil. Chaos worshipers do not seek the extinction of humanity, they just have a very different way living. It does include a huge deal of suffering and bloodshed, but the Imperium officials aren't exactly shy of that as well, are they? In short, Chaos may be evil, but in the end it is no more evil than other 40k factions. As for orks, yes, most of them are unintelligent, but so are most of the humans. Even more so, since there are thousands of feral worlds, where people lack even the basic tech, while even the most primitive of feral orks knows how to build a slugga from scrap. And all talk about a power of their belief is a fan speculation with no serious background material to support it. There is only a power of a fan believing in what he chooses to believe. Thanks for your input anyways. I definitely agree with the author here, despite the above commentary. Orks are brutish and sluggish and dumb, sure, but they're also one of the most potent forces in the galaxy, capable of creating war machines the likes of which even SPACE MARINES in all of their INCREDIBLY ADVANCED technology have a DIFFICULT time bringing down. 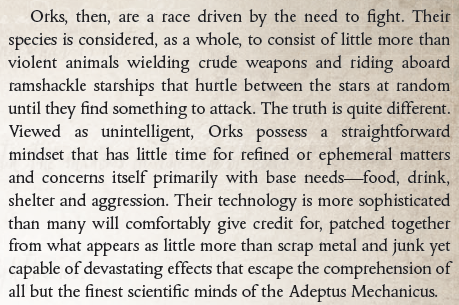 Saying Orks are simply a race of dumb, animalistic beings is ridiculous, considering they were created by a race which also created the ELDAR, is a pointless argument. Similarly, saying that Chaos is nothing but evil, is also an oversimplification of the meaning behind the nature of Chaos itself. Take DND as a good example. There is Chaotic Good, Chaotic Evil, and Chaotic Neutral. A Chaotic Good cultist is one that believes he is genuinely doing good by spreading the word of his religion, he believes that the real evil lies in the Emporer, and that the Ruinous Powers - whilst certainly extreme - are doing well for their followers. Or, perhaps, it can be broken down even further: A follower of Tzeentch might see the good in bringing about the plan of a deity which has planned out all of existence in detail to benefit the maximum number of his own followers; a Nurglite might see the good in the long, slow degradation of everything... an end to all the death, destruction, and suffering by way of resilience, infestation, and spreading of the very thing that, without Nurgle, might even kill off their entire species. A Khornite whom might see the good in Khorne would look at the idea of blood itself, the skull itself. While it is generally bad to shed blood and rip out skulls... It's not so bad if that blood goes to waste otherwise, if the brain inside that skull is bent to serve a false Emperor possessed with the idea that only humanity can be served, the blood in the veins of those whom don't serve Khorne is simply a waste and must be shed, given to their God. Much like the ancient Aztecs, were they evil for ripping people's hearts out and sacrificing them so that the rain god would save the rest of everyone by fertilizing their crops? NO. It's all about belief. And Slaanesh is the easiest to prove, he wants to bring pleasure and pain, the two abject realities of human life, to bear upon all of his servants. He wants to make them beautiful, he wants to get them high, to forget their suffering, to ENJOY everything. Literally. I believe the author of this article is not only a fantastic 40k fan but also has a high amount of logic in his reasoning and even cited some of the oldest 40k sources for a look into why he based his claims the way he did. When I was growing up on this stuff, this is exactly the way I saw it, too, so no, it's not wrong, but again, you're ALLOWED to disagree as "new 40k" is very different from "old 40k" and definitely can be seen as more black and white. But people like me are far more interested in grey. To be fair, DND has a very different setting from 40k. But I agree with a lot of points you make. Overly simplistic view of the 40k universe definitely robs it of its best qualities in my opinion. Glad you liked my article and thanks for your input!